I’ve always had a casual interest in crows. Primarily for their social structure and intelligence. But I, like most people, have taken them for granted over the years. This all changed soon after our arrival in Southern California. We were introduced to the Murrieta Crows Roost early after our California arrival in late 2009. 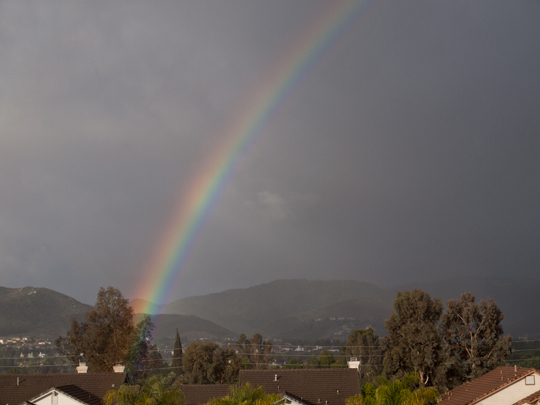 While we were looking for a home we rented an apartment in Murrieta, CA. 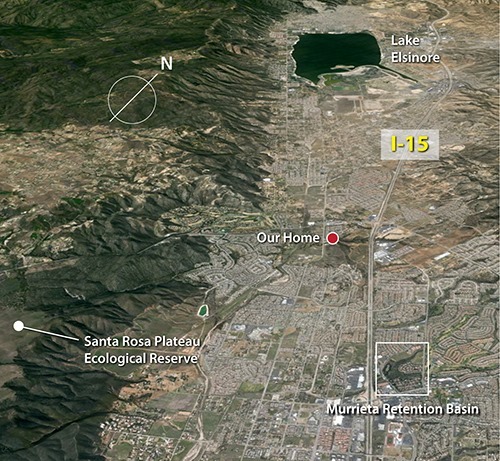 The apartment complex is located adjacent to the Murrieta Retention Basin. 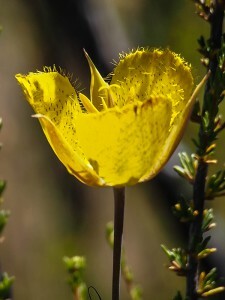 The retention basin contains water year round and is host to the largest contiguous forest of large trees in the area. The trees extend into the apartment complex area and our unit was located under a number of large trees. 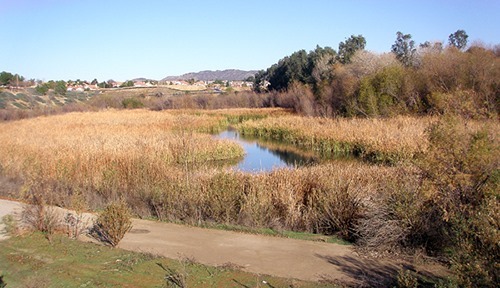 The retention basin is a terrific birding spot with a trail around its perimeter but the area doesn’t attract a lot of birders since there is a lack of parking in the area. It’s easy to see that the large tall trees (pines, sycamores, eucalyptus, and others) provide the perfect place for a communal crows roost. 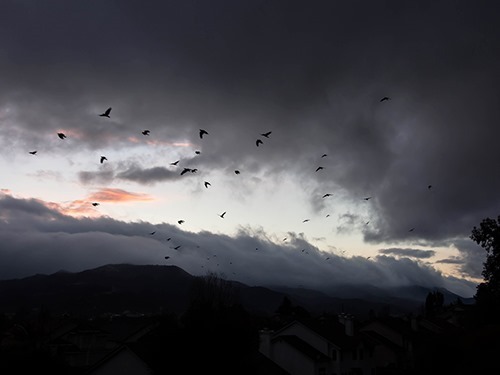 It rained for three straight days when we moved into the apartment and nothing out of the ordinary occurred, although the local residents thought three straight days of rain was quite “unusual.” At sunset on the fourth day we heard a lot of crows calling. We went out on the patio to see what all the commotion was about. It was quite a surprise as “calling” crows dropped into the trees by the hundreds. The crows would sit for a while then rise up and put down again. This went on for some time before they all settled down in the trees for the night. At sunrise the next morning all the crows were gone. I asked some of the other residents of the apartments whether this was a regular occurrence and they casually responded, “Yeah, it happens every night!” From then on we witnessed the evening event on a regular basis making sure to get under cover on their arrival. It was common for the crows to “dump their excess baggage” before settling down. 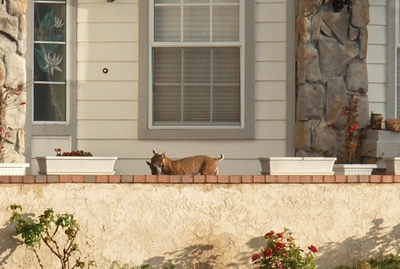 A month and a half later we found a home five miles north of the Murrieta Retention Basin. We moved into our new home under a steady two days of rain. 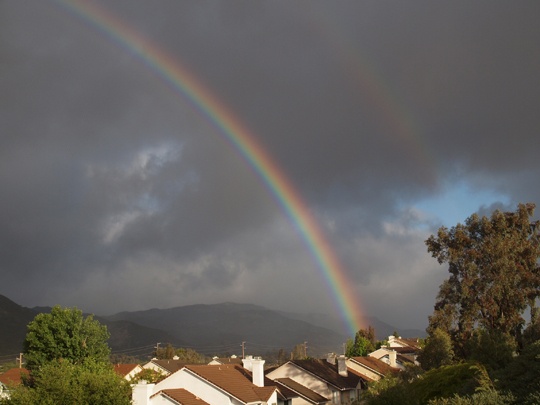 Our new welcoming neighbors remarked about the “unusual” amount of rain. During a downpour our first yard bird at our new home ran around on our front lawn occasionally posing on a boulders. 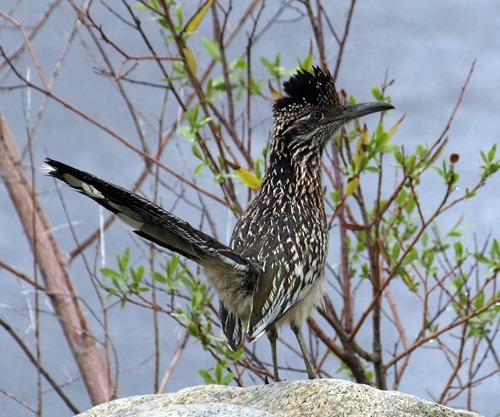 The Greater Roadrunner welcomed our arrival. 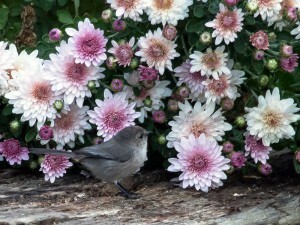 I took this event as a harbinger of more good birding things to come. After settling in to our new home, I had more time to start renewing my acquaintance with the western birds and to begin creating my new yard list. I also had time to enjoy the cool evenings in the backyard and immediately became reacquainted with the crows once again. Our new home is located “in the path of crows” that fly to the communal roost each evening from the north to the roost five miles south. Since first witnessing the crows roost and now living along the northern route of the crows, I have become interested in learning more about the nature and structure of the roosting crows. Apparently there is little known with regards to why, when, and where crows decide to share a common roost. 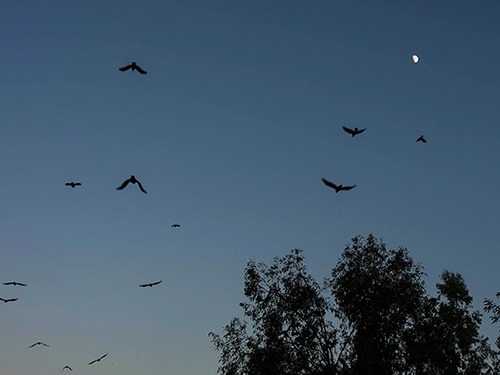 The website crows.net lists the number of crows at the Murrieta Crow Roost to be in excess of 3,000 birds. 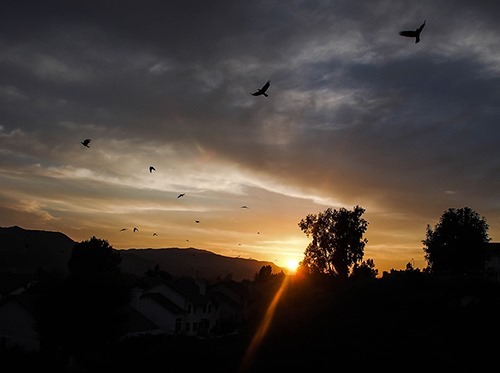 The site also indicates that there are only two crow roosts in Southern California. 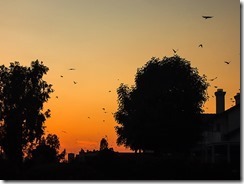 I have been at different locations in the Temecula/Lake Elsinore valley in the evening and have observed crows flying to the roost from all different directions. It appears that the northern component (the ones that fly over us) make up at least one third to perhaps one half of the total roost population. 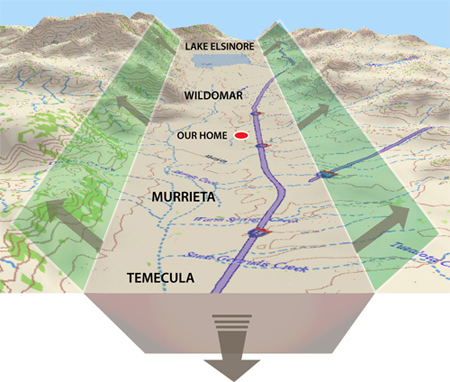 This would make sense since Lake Elsinore and the area north of the roost site is more rural than south and east of the roost site. The area west of the roost site is the Santa small numbers of crows heading east to the roost at sunset. 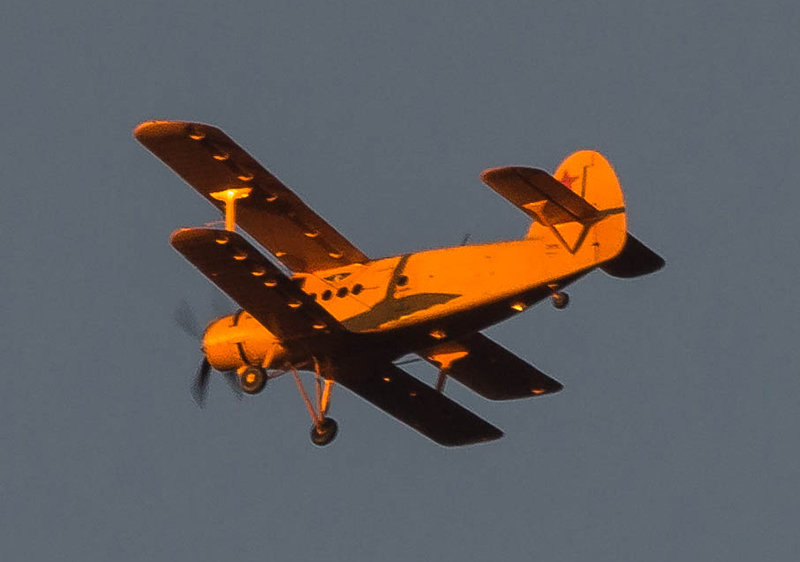 I have conducted a number of crow flight counts to get an idea and to see if there are any patterns that might be of interest occurring. 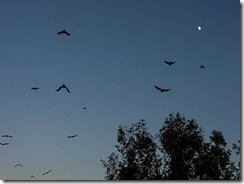 During the 2012 Christmas Bird Count, I counted 1,268 American Crows (AMCR) heading to the roost. During a BIG SIT in 2011, I counted 1,195 AMCR heading to the roost. I also conducted a 12 day count in 2011 which resulted in a 12 day average of 664 AMCR (9 days of 500 or more, and 2 days of inclement weather). Just this past week I was up early to photograph the full moon setting before sunrise – during that time I count in excess of 700 AMCR heading north from the roost site. 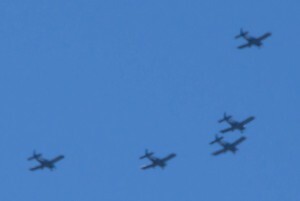 It appears that there are three or four distinct flocks coming through each evening from the north. The first flock passes through just before sunset, the second flock shortly after sunset, and the third and fourth flocks closer to dark. There are always a few stragglers bringing up the rear. I’m guessing that the distinct flocks may be related to the distance the crows are from the roost when they initiate their flight (the first flock – closest to the roost, the remaining flocks- further away). The crows roost essentially ceases to be during the breeding season with the exception a few non-breeding birds that continue to fly to the roost each evening. Soon after the breeding season ends and the young have fledged the numbers heading to the nightly roost start picking up again. During this time there is a lot of “calling” among the crows during the flight to the roost, perhaps the parents trying to keep the youngsters on task. There appears to be a pre-flocking process that is used from time to time. Prior to initiating their flight to the roost the crows first gather at a staging area. A lot of “calling” takes place during this process and at some point a command is given and the flock of crows begin heading towards the roost site in silence. The staging areas appear to be random and may not be used on a daily basis. The purpose for these staging areas remains unexplained but may be weather related or perhaps staggering the flocks so they don’t all arrive at the roost at the same time. 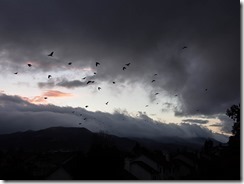 The line of flight of the crows each evening is weather dependent. Generally from our vantage point we can see most of the crows heading to roost each evening even if the flocks choose an alternate route. During inclement weather or heavy winds the flocks may be hard to see. The crows fly low in the valley and blend in with the trees along Murrieta Creek. 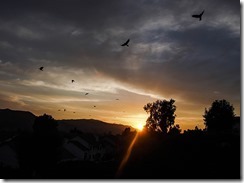 We are very fortunate that our new home in Wildomar, CA provides us the rare privilege of witnessing nature’s free outdoor entertainment almost every evening. Last year I wrote a brief account of my first BIG SIT event in California and explained the rules and history of the BIG SIT in that account. That information is still available in my BLOG account of the 2011 BIG SIT. The scope and camera were setup and ready to go at 7:30 AM, with a cup of coffee in my hands and my bins (binoculars) around my neck I found a comfortable chair. The 2012 Stonehurst BIG SIT was underway. The skies were clear with calm winds and the temperature was a cool 57 degrees. 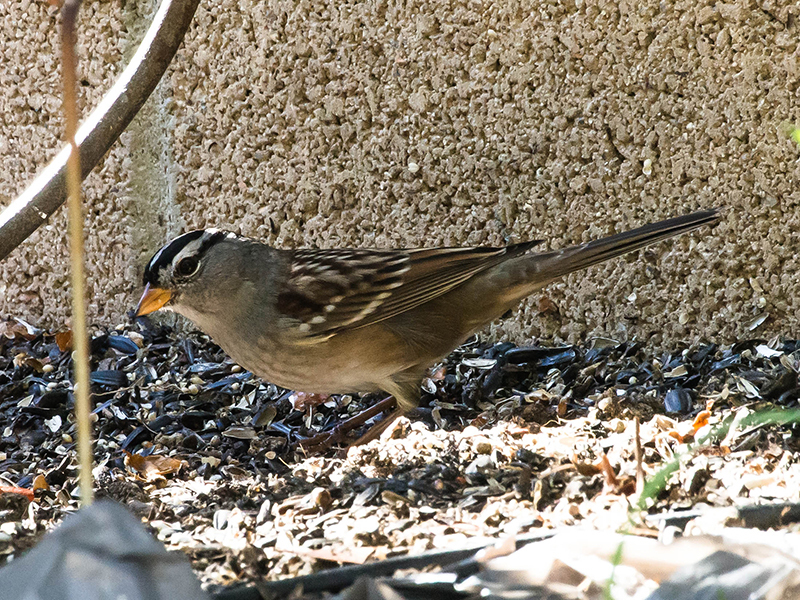 It wasn’t long before the first bird of the day appeared, a skulking White-crowned Sparrow under the shrubbery gleaning for seeds beneath the feeders. 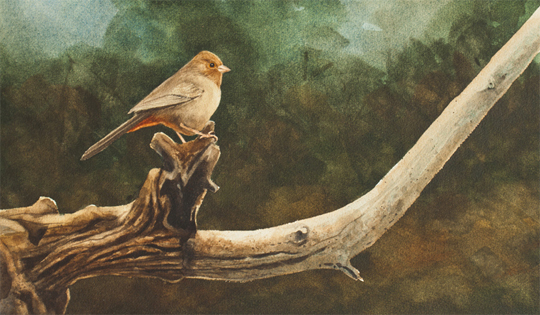 The sparrow was still a bit shy while he waits for more of his comrades from the north to arrive for the winter. 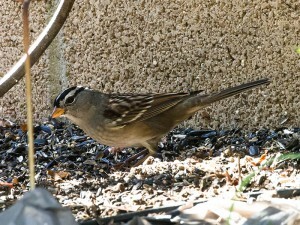 Once there is safety in numbers, the White-crowned Sparrows are quite gregarious. 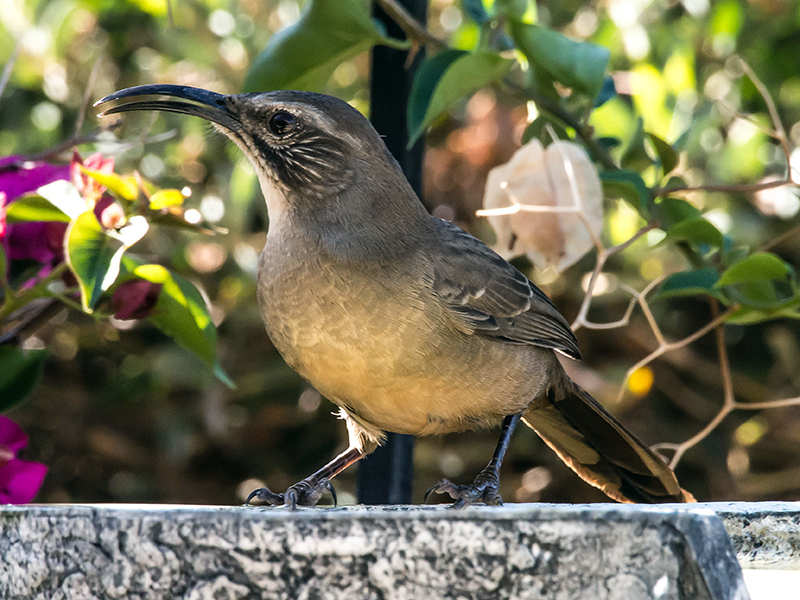 The sparrow was quickly followed by two California Thrashers arriving to gather sunflower seeds and drink at the water feature. 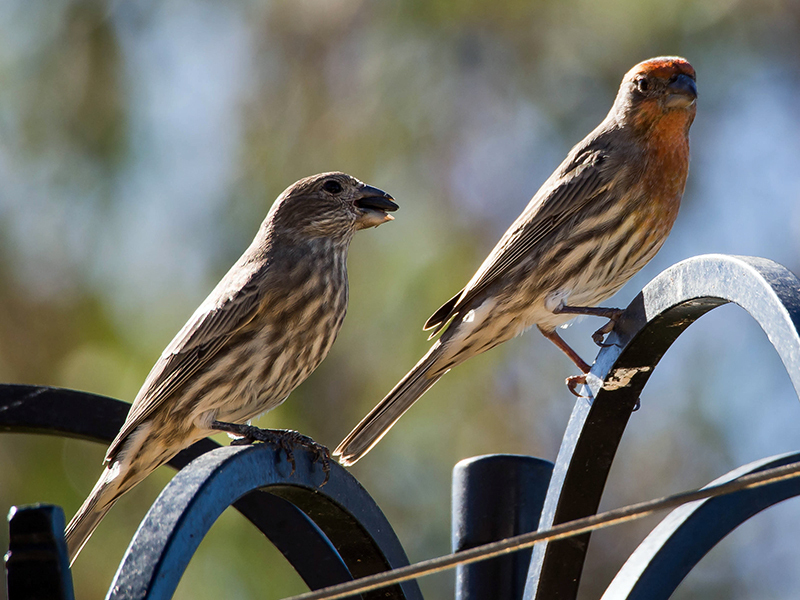 These two birds were introduced to our feeder/water complex by their parents earlier this year, and have been regular visitors ever since. Other birds began to trickle in here and there but for the most part the bird activity remained relatively slow. 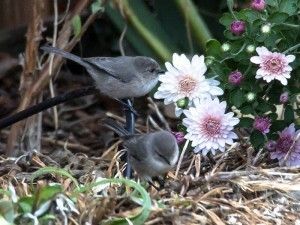 The non-resident breeding birds had already left and the wintering birds were just beginning to arrive. The weather forecast for today was HOT. It’s the middle of October and the forecast temperature for this day was 95 degrees. At 11 AM the temperature had risen to 82 degrees, and still no soaring birds had chosen to go skyward. Twenty-two Bushtits made a brief appearance to glean what they could from the plantings, seldom standing still for more than a second or two. Anna’s Hummingbirds frequented the feeders regularly only to be chased away by the “bully” Anna’s Hummingbird after a brief feed. A single Costa’s Hummingbird made a brief appearance. At noon the temperature had risen to 86 degrees. I took a short lunch break from 12:30-1:00 PM to cool off a bit while still keeping an eye to the sky from inside the house. When I returned to my count circle the temperature had reached 91 degrees. With the sun now on the south side of the house, I moved under our covered patio to take advantage of the shade. We had the patio covering installed last year we wanted a lattice-type covering, but the salesman convinced us that a solid covering would provide more shade and keep things dry during the rainy season. At the time that seemed like a good idea so we went with the solid patio covering. Now after our second summer with the patio covering we are realizing that maybe it wasn’t such a good idea after all. The south facing patio Alum wood cover serves as a heat trap during cloudless sunny days. After mid-day, the temperature under the patio covering begins to increase at a rate of 5-10 percent over the ambient air temperature. This continues until the sun sets. At 1:00 PM both the ambient and shade cover temperatures had risen to 91 degrees. Finally a few soaring birds began to appear. 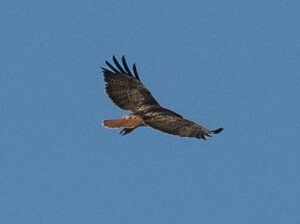 A Turkey Vulture flew over and a couple of Red-tailed Hawks rode the few thermals caused by the rising temperatures. At 1:15 PM, a bird or birds caused a shadow to be cast when passing the sun. I jumped up to see what I expected to be a large hawk or vulture, but was surprised when I noticed a flock of 26 blackbirds. They came in from the south passed our home then made a sharp turn to the northeast. They were moving fast but I was able to get a quick look at the birds through my bins as they disappeared out of sight. I was speechless and astonished to what I had just witnessed. As the birds rapidly passed by, the flash of yellow to the throat and breast of these blackbirds left me in awe. I had seen this bird a number of times in the east and Midwest, but usually as a solo bird mixed in with a flock of other blackbirds. I was thrilled to see my first flock of Yellow-headed Blackbirds. 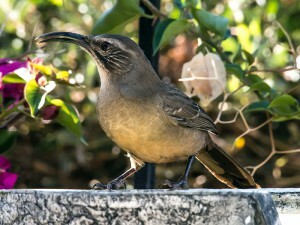 This was also a CA State bird for me. These birds were most likely migrants heading for the San Jacinto Wildlife Area 9 miles to our northeast which was the direction they were heading. Yellow-headed Blackbirds are regular winter visitors at the San Jacinto Wildlife Area. At 2:00 PM the ambient temperature was 93 degrees as the shade cover temperature had risen to 98 degrees. The afternoon count slowed as the temperature rose. At 4:30 PM the ambient temperature was 95 degrees and the shade cover temperature was now 100 degrees. I began preparing for the Stonehurst BIG SIT finale, COUNTING CROWS. Each evening at sunset crows from the north head to a common roost site at the Murrieta Retention Basin, 5 miles to our south. Usually the crows fly above the skyline making them easy to count. At 6:00 PM the sun dropped behind the mountains, the winds were calm, and the ambient and shade cover temperature both dropped to a comfortable 86 degrees. At 6:08 PM the first crows began to appear, tonight with calm winds, they were low below the skyline making counting a challenge. For the next 22 minutes I counted a steady flow of crows. The final tally was 1,195. While counting the crows I noticed two Phainopepla capturing insects at sunset, I clicked another bird species to the total BIG SIT count. I thought about staying out to see if I could get the Barn Owls that regularly forage in our area, but decided to shut down the 2012 Stonehurst BIG SIT at 6:30 PM, the temperature as now down to 81 comfortable degrees, and we opened the house to let the cool evening air flow in. I do like this Mediterranean climate. All in all it was a nice relaxing productive birding day! It’s been a long time since I have spent a day totally devoted to a birding activity. TOTAL COUNT: 26 species (6 more than last year). Late last year we recieved a letter from the Kindergarten Teacher where our great niece was attending school in Ohio. The letter explained that she had been reading many stories to the children about gingerbread men, boys, and girls from all over the world. 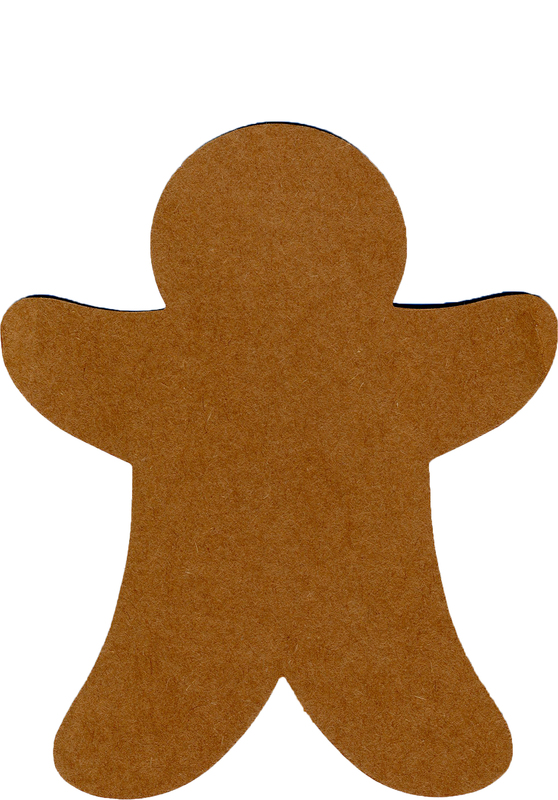 Included in the letter was a blank gingerbread cutout with a note stating to be as creative as you wish. Those words, creative as you wish, was all I had to read. Following is the story I developed and returned to the teacher on behalf of our great niece Ava. Several weeks ago I heard some tapping at our front door. When I opened the door nothing was there. I thought the wind probably made the noise. Closing the door I looked down to see a gingerbread man standing at our front door. I picked the gingerbread man up before closing the door and placed it on our kitchen table. 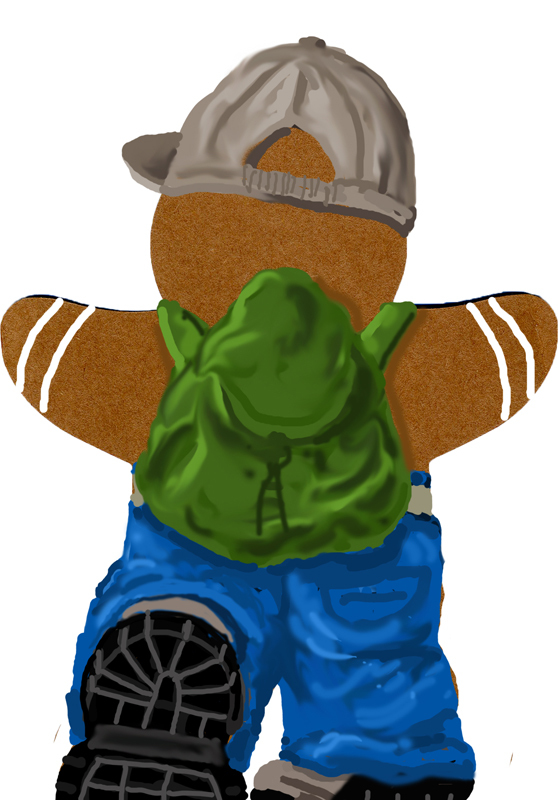 It was just a gingerbread man cookie with no features or identification from where it came. I went back to doing what I was doing before I answered the door. I soon realized that our guest was not a gingerbread man at all, he was really a gingerbread boy. I asked him where he was from. He told me that he snuck out of his school in Ohio to seek adventure. He wanted to go to a place he had never been. He then wanted to return to his school to share his adventures with his kindergarten friends back in Ohio. I was impressed with his adventurous spirit and told him we were more than willing to help. We also promised to get him back to his school in time to tell his friends his adventure. “So,” I said, “you’re the Ohio Gingerbread Boy?” “Well,” he said, “I am from Ohio and I am a Gingerbread Boy, so I guess I am the Ohio Gingerbread Boy!” I asked the Ohio Gingerbread Boy if I may call him BUCKEYE for short and he excitedly agreed. “I am a BUCKEYE,” he shouted! Our first day with BUCKEYE was coming to an end and we had to decide where best to put him to bed. Out cat VELCRO would love to have sniffed (he wouldn’t hurt him) BUCKEYE all night long but wouldn’t give BUCKEYE much rest for his upcoming adventure. I decided to put BUCKEYE in the computer where he could rest peacefully and be safe. The next day we awoke and BUCKEYE was already up looking out our back window. He saw me come in and shouted, “WOW, I love those mountains!” I told BUCKEYE that those were the Santa Ana Mountains and that the Pacific Ocean was just on the other side of those mountains. BUCKEYE asked if he could go to the Pacific Ocean, but I told him there probably would not be enough time. I told him that we would go up the mountain to a very special place in a few days. I asked BUCKEYE if he would like to help me feed the hummingbirds in our backyard, he immediately agreed and told me that he wasn’t sure he had ever seen a hummingbird before. I told BUCKEYE that in Ohio usually only one kind of hummingbird is seen, but, here we see five or more different kinds. We filled the feeders and BUCKEYE got to see both an Anna’s and Costa’s Hummingbird. BUCKEYE mentioned that our weather was very dry and he didn’t see many trees. I explained to BUCKEYE that we live in a Mediterranean Climate area where there isn’t a lot of rain and the days are warm and the nights are cool. Since there isn’t a lot of rain the trees are few and smaller and only plants that don’t need a lot of water can survive. After outfitting BUCKEYE with hiking shoes and a hat, I took BUCKEYE up to my special place on the Santa Ana Mountains. 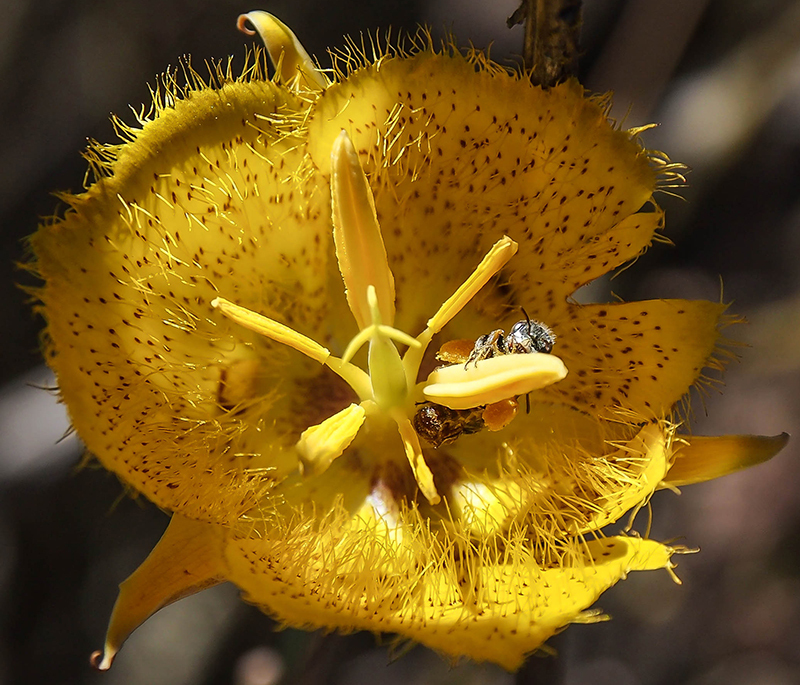 The Santa Rosa Plateau Ecological Reserve (SRP) which is less than ten minutes from our home. I showed BUCKEYE how to recognize animal tracks, and introduced him to the Chaparral plant community. BUCKEYE enjoyed sitting in a Scrub Oak and patches of Lichen. 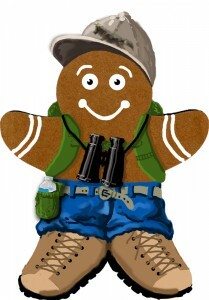 On our short hike back to the car we ran into Ranger Rob. I introduced Ranger Rob to BUCKEYE and they immediately became friends. Ranger Rob showed BUCKEYE around the SRP Visitor Center. As BUCKEYE and I were heading back to the car, Ranger Rob yelled out, “BUCKEYE, you’re invited to come with Jim on his nature hike with the 3rd-graders!” BUCKEYE immediately shouted, “YES,” and raised a gingerbread fist! 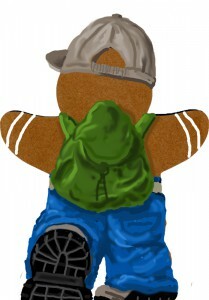 I must admit, I have never seen a gingerbread fist before, it was impressive. I told BUCKEYE that before we could go on the 3rd-graders hike that I would have to provide him with more equipment. A water bottle would be necessary since even when it is cool here the sun shines bright and you will need water. I also provided BUCKEYE with a backpack so he could keep extra water and snacks. BUCKEYE was now ready to go on his SRP hike. BUCKEYE and I got up early so he could help me load up the car with the materials I needed for the nature hike. BUCKEYE was excited and kept asking when we were going to the SRP. I assured BUCKEYE it would be soon and explained that we should always have a good breakfast before we go on a hike. After breakfast we headed up to the SRP. We went into the SRP Visitor Center to await the school bus that would be carrying the students from the Lake Elsinore Elementary School to the SRP. While waiting for the bus I introduced BUCKEYE to the other SRP docents who had arrived to help lead the 3rd-graders on their nature hike. One of the docents brought in two huge bags of a special fruit. BUCKEYE climbed up on the pile of fruit and said, “What are these?” I told BUCKEYE that they were California buckeyes, and everyone chuckled. BUCKEYE told us that they didn’t look like the Ohio buckeyes he knew. I confessed to BUCKEYE that I was just joking and that they were not buckeyes at all. I told BUCKEYE that they were Persimmons from a Persimmon tree, and mentioned that Persimmon trees grow very well in Mediterranean Climates. I mentioned that the fruit was delicious and people eat them before they are ripe, when they are ripe, and when they are dried out by the sun. Coyotes love them as well. One of the docents shouted, “The bus is here,” and we all gathered up our equipment and headed out to greet the visiting students. I placed BUCKEYE on the top of my pack. When the students were divided into smaller groups and the docents selected their group, the two hour nature hike began. I still had BUCKEYE on the top of my pack when I took my group to a trailhead to start our hike. I introduced myself, talked about what we might see and where we would be going. I noticed that some of the students kept looking at the top of my pack and smiling and giving little waves. I knew that BUCKEYE must have been waving at the children. I finally told the students that we had a special guest for this hike and introduced them to BUCKEYE. I told the students that BUCKEYE was from Ohio and was on an adventure, and that he had to return to Ohio soon. I asked the students if they would like to help me on the hike with BUCKEYE, and they all agreed. I divided my group of students into four smaller groups; the Acorn Woodpeckers, Bobcats, Coyotes, and the Dangerous Deer. This gave all the students a chance to be at front of the line as we switched groups during the hike. I then gave BUCKEYE to the Acorn Woodpeckers who would be the first group to lead the hike. 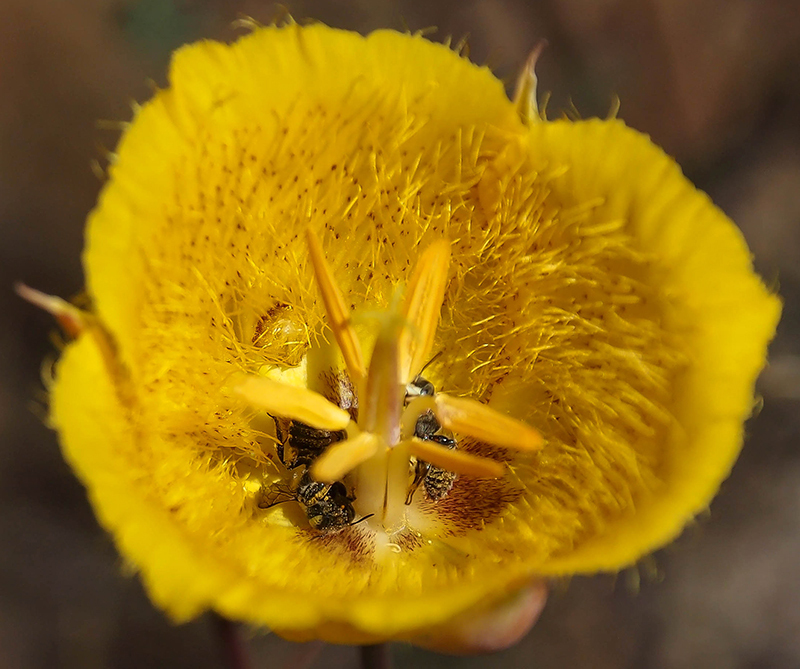 The nature hike went very well and the children enjoyed showing BUCKEYE all the things they were learning about as we passed through the Chaparral, Oak Woodland, Grassland, and Riparian plant communities. The Bobcats, Coyotes, and Dangerous Deer also enjoyed passing BUCKEYE amongst themselves and making sure he got to see everything when their group was leading the hike. Several times when I was explaining what we were looking at I noticed that the students were holding BUCKEYE up high so he wouldn’t miss a thing. Towards the end of our hike a little girl approached me and told me that BUCKEYE told her that he would like to stay with her. I smiled and told her that I am sure he would, but he had to return to Ohio soon so he could share his adventure with his school friends in Ohio. The nature hike came to an end and I passed out mementos to the students to help them remember their SRP Nature Hike experience. Since BUCKEYE participated with all four of the smaller groups I gave BUCKEYE all four of the group cards. I asked BUCKEYE if he had a good time and BUCKEYE started talking and smiling, and talking. BUCKEYE told me all the things he saw, and all the friends he made, and how he would have loved to stay with them all. BUCKEYE talked all the way to the car and during the drive down from the plateau. As we were pulling into our driveway, I wondered why the talking had stopped and I looked over at BUCKEYE who was in his seat belt, he was sound asleep. I gently carried BUCKEYE into the house and put him back in the computer for a nice long nap. I think BUCKEYE most certainly had a great time with the 3rd-graders on their nature hike. BUCKEYE awoke a little before sunset and I asked him how he was feeling. He smiled and said, “I feel so special, I made so many new friends today, and saw so much cool nature stuff, I had a great day!” I told BUCKEYE that I knew he would like the hike and meeting new friends. I was so happy that he had such a great time. After watching the sun go down and having a nice dinner, I told BUCKEYE that tomorrow we would have to get him on his way back to Ohio. He first looked shocked, then sad, and then a BIG GRIN filled his face. BUCKEYE told us that he knew his adventure would have to come to an end and that he would have to get back to Ohio to share his adventure with his friends , but until he heard the words he had put the thought out of his mind. He was sad at first but the realized that he had so much to tell his kindergarten friends back in Worthington, Ohio about his adventure and that made him very happy. We told BUCKEYE that he was always welcome and the next time he came back we would make a trip to the Pacific Ocean. BUCKEYE smiled and crawled back in the computer to go to bed. The next day we packed up BUCKEYE with all his mementos and souvenirs and the gear we provided him for is hike on the SRP. As BUCKEYE left I asked him if he was sure he knew his way back to Ohio. As he jumped off our front step and headed down the walk, he turned and with a smile said, “I knew how to get here didn’t I?” BUCKEYE continued on his way back to Ohio walking proudly with his head held up high. As he faded into the distance, we thought we heard him whistling California Here I Come and wondered whether that meant he might be back some day. BUCKEYE returned to his school with a PHOTO ALBUM and POSTCARDS of his adventure in Southern California and the Santa Rosa Plateau. His return was received with great interest and appreciation. We are looking forward to Buckeye’s return. copyright 2012 jl-studio – All rights reserved. What’s a BIG SIT (don’t say these words too fast), you ask? Bird Watcher’s Digest, the official sponsor, describes The BIG SIT as, “A Tailgate Party for Birders!” The original idea began with the New Haven, CT Bird Club 17 years ago. Though touted as an international event its popularity resides primarily in the Midwest and Eastern US. The rules are pretty simple. The counting team (one or more individuals) must stay within a designated 17 foot diameter circle (you can cram as many individuals, pets, and food in the circle that will fit) to count and tabulate the birds that heard or seen from the circle. BIG SIT sites can pick their own hours, 24 if they like (12:01 AM – 11:59 PM), but most sites run their BIG SITS from dawn to dusk. 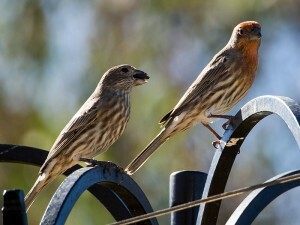 For complete BIG SIT “honorary” rule information check out the Bird Watchers Digest BIG SIT RULES. I must say BIRDERS, when it comes to their birding, adhere and abide by an honorary rule system like no other I have ever seen. Its success is simple however. 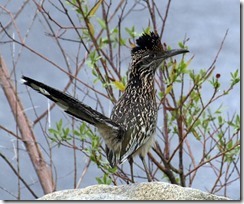 Avid Birders are extremely knowledgeable about all aspects of their recreation. A single bird species migration dates, range, habitat, most recent sightings, songs, calls, and subtle feather markings are all recorded in the birdalogus portion of left hemisphere of their brain. This establishes an immense database that provides a very strong cadre of individuals with regulatory power to maintain the BIRDERS Honor System. As you might imagine any deceitful, dishonest, or birding braggart that might show up in the birding community is quickly found out and exposed. Occasional bird miss-calls and improper identifications by reliable birders are graciously forgiven. But if a continued pattern of sensational sightings and/or birding claims prevail the reporting party is deemed unreliable and the name of the individual ripples through the entire birding community. Hmm, why did I go there? 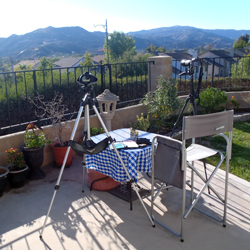 This is somewhat of a stall from reporting my meager results of the 2011 WILDOMAR, CA BIG SIT. Since I was the only one participating in my 17 foot diameter circle in my backyard at Wildomar, CA, as far as I could tell there were probably no others doing a BIG SIT within a 25 mile radius of my location. I had all the opportunity to inflate my count and noone would ever know. Well, noone but myself and the other excellent birders in the area where we now reside! I was fortunate to be tutored by some of the best birders in the Midwest and East Coast and they taught me well. They have more birdalogus brain matter than I have in my little finger nail and I would never disrespect them by doing something stupid. Plus, I’m a member of the ABA (American Birding Association) and for any kind of fraud I would surely be excommunicated from the organization, unless my dues were paid up, of course. I woke up on Sunday morning forgetting that it was BIG SIT day. 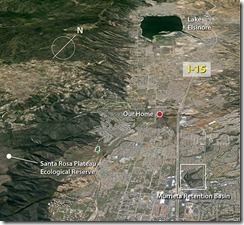 When running through my daily computer stops; CA earthquakes since I last looked the night before, the weather, the news, email, and Facebook – there it was on Facebook. 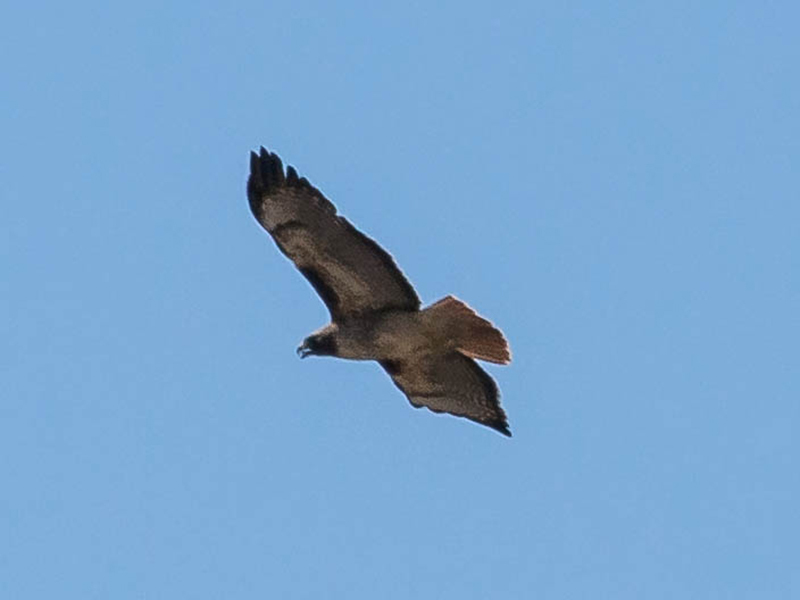 A message appeared that the Rose Tree Park HawkWatch (A location where I spent over 10 years of hawk watching) BIG SIT was under way. My BIRDER TAILGATE PARTY started in my WILDOMAR, CA BIG SIT circle at 0800 PDT with me as the single partygoer. The weather was very nice and the views beautiful with cirrus clouds streaming over the Santa Ana Mountains. 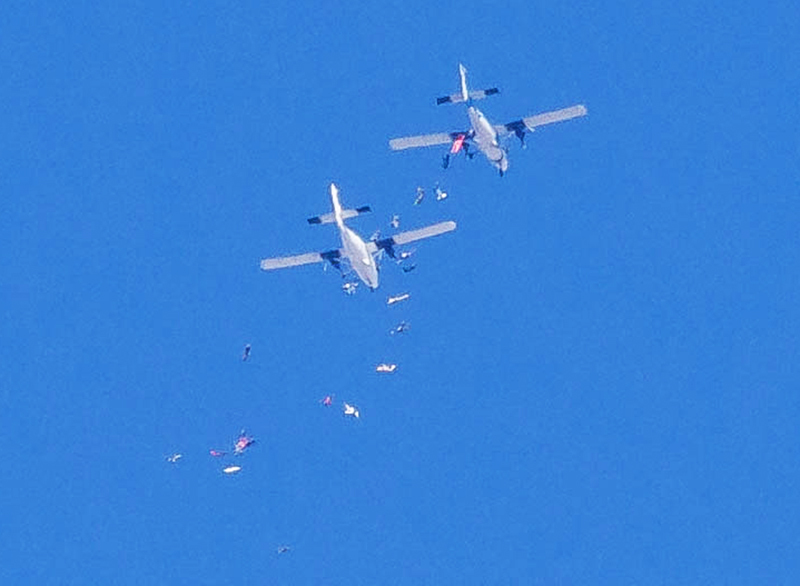 The first aerial activity viewed from the circle began at 0930 PST when the first sky dive plane gained altitude over our home before depositing its contents further north. I thought it was a bit early for a drop but once it was made I realized it was some sort of sky dive team doing a rather dangerous maneuver. At 0945 PDT the first sailplane was observed in tow overhead. By 1030 PDT the winds from the west had increased and the sailplanes called it a day, as did the birds. West winds don’t favor the soaring planes or birds and it seemed to kill other bird activity as well. I finally decided to make this a SOUTHERN CALIFORNIA BIG SIT so I shut down the circle at 1200 PDT, had a nice lunch – Tuna salad on Jalepeno Cheese Bread, and took a very nice long SIESTA (for those of you who don’t speak Spanish SIESTA=NAP). At 1600 PDT I reopened the Count Circle for business, well casual business at best. I did pick up two distant soaring birds, one diving on the other. Putting the scope on the activity it turned out to be a White-tailed Kite diving on a Red-tail Hawk. 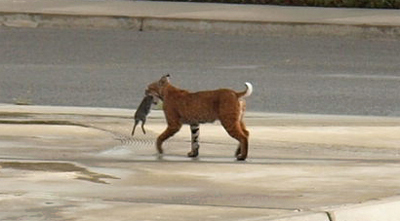 This turned out to be the best sighting of the day. 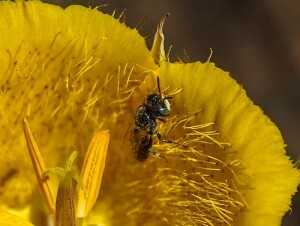 I ended up counting a whopping total of 20 species of birds, a reptile and a few insects. Nothing exceptional or not expected were seen. Perhaps the late Black-chinned Hummingbird might be considered unexpected. It was nice to see the White-crowned Sparrows back for the winter and the 18 soaring Ravens were a morning highlight. The THREE Stooges - House Sparrows . . . . The FOURTH is sitting in a chair watching them! I will mark the date on my calendar for next year and do it again. Once you have been infected with the birding bug it is impossible cure. After nearly two years of non-intentional ART IDLENESS, a result of our relocation from EAST to WEST, I have recently been reawakened to the wonderful world and pleasures of creating original ART. It was two years ago, July 1, 2009, that I suspended my ART activities in PA as we began preparation for our relocation west – An exciting time into the unkown for sure. Since arriving in Southern California in late November 2009 we have spent most of our time settling in to our new home. My post-settlement creative time has been spent photographing everything and anything to learn more about the wonderful natural world in our new location. 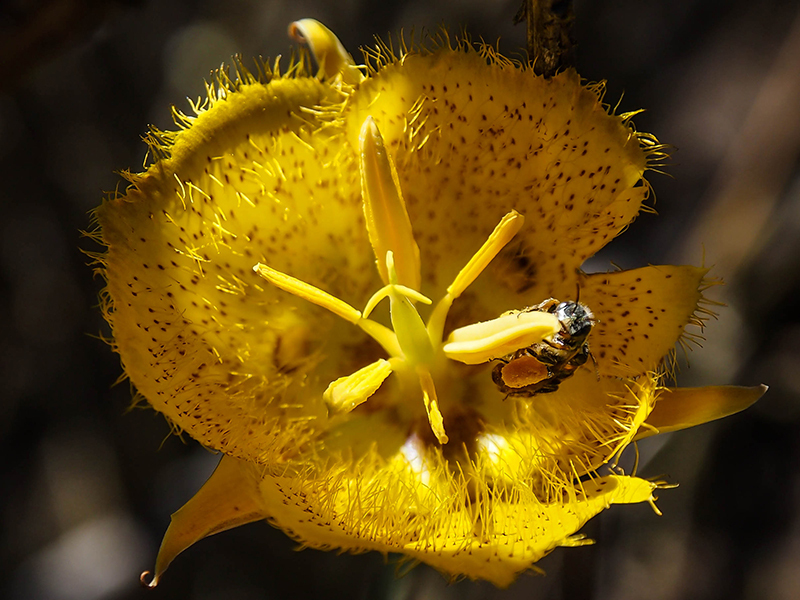 The Santa Rosa Plateau Ecological Reserve (SRP), just 5 minutes from our home, has been of particular interest. The SRP hosts an annual Art Show each summer so in April I decided that it was time to put down the camera for a while and start creating some original ART again. The studio space, until now neglected, was put into full operation. It was great to get back to using brushes, pencils, paints, and paper again. 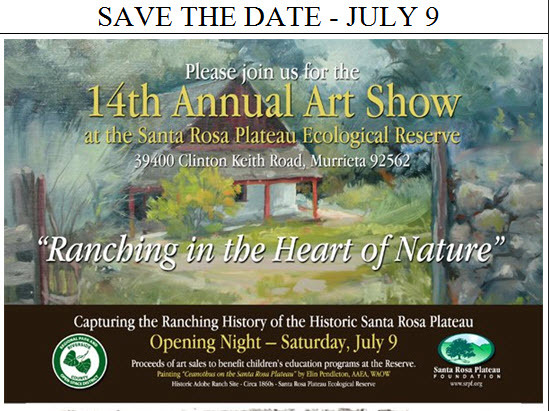 I will be showing my recent works at the Santa Rosa Plateau Ecological Reserve 14th Annual Art Show, July 9 – August 20, 2011. The beautiful Santa Rosa Plateau provided the subject matter for the work which will include watercolors, mixed-media, and photographs. While cleaning out some portfolios so I could use them to transport the new artwork to the SRP I came across an item that stopped my task and warranted my immediate attention. It was a piece of mat board that I had pasted some items on years earlier. Since this item was so appropriate and timely, I had to stop what I was doing to provide the deserved attention. I found an empty frame that was worthy and proceeded to mat and frame the item so I could hang it in a prominent place in the studio where it belonged. On Christmas 1994 I received a wonderful gift from our son Jason. It was an assortment of art supplies that was accompanied with a special note. Here is some paint’in stuff. You should really start painting again you’re really good at it. It wouldn’t take a lot of time to start dabbling and then painting. I think it would relieve a lot of stress and be very beneficial. Look at Uncle Bernie with his wood carvings. You just have to set aside some time. I know it’s hard to find time but there is no time like the present. I think you need to hear this to give you a little push. I hope you start painting again. It would be a terrible waste if you didn’t. The item in question was the collection of Jason’s original note scrawled on four 5×7 yellow note pad sheets which now hangs proudly in the new studio. We are looking forward to the Art Opening this weekend and enjoying Jason and Rita’s company when they come down for the weekend to enjoy the festivities. 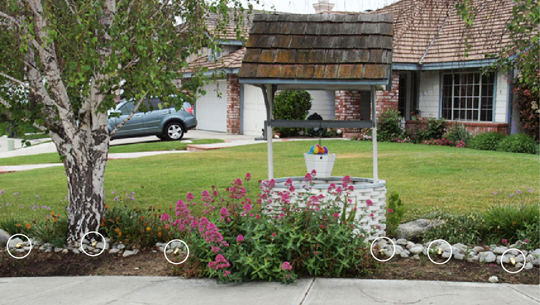 We inherited a wishing well when we purchased our home in Wildomar, CA. It required a little work to stabilize its aging structure. I suggested that perhaps it would be a good idea to remove it and replace it with something more contemporary. Judy remarked that she had always wanted a wishing well and advised that it might be a better idea to let it remain. After completing several structural stabilization projects and removing the artificial flowers from the wishing well bucket, the wishing well remains in place. It is top heavy and still leans a bit to the east despite the stabilization. More stabilization projects are warranted. Accepting the decision to keep the wishing well prompted me to think that the wishing well might make a nice venue to decorate for holidays and special events. Last Halloween season I removed the wishing well bucket and replaced it with a plastic pumpkin. Christmas Bells and a red bow replaced the bucket for the Christmas season. Then came the approach of Easter this year and I started looking for a large egg or eggs to replace the wishing well bucket. Unable to find any suitable large eggs, I decided to get some smaller plastic eggs, glue them all together and place them in the wishing well bucket. The chore took more time than I anticipated but the project was finally completed and the decoration was presented to the neighborhood. I placed several left over plastic eggs from the project to fill the void spots. I must say it turned out to be an attractive and subtle decoration appropriate for the season. 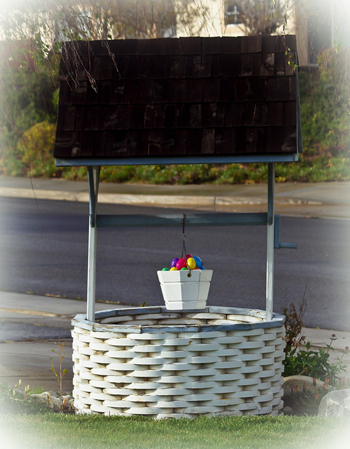 I began noticing that neighborhood children were attracted to the decoration and the Easter eggs therein. Over time some of the single eggs were removed. On one occasion when I heard children’s voices at the wishing well and observed a little girl yelling at her brother who was chasing a plastic egg that was rolling down the street. His sister was in the wishing well quickly putting the pieces of the decoration back in the wishing well bucket continuing to yell at her brother who apparently caused the original problem. Late on Easter Day the Six Golden Eggs remained in place. It appears that most of our neighbors were elsewhere today and few children were seen. A second day passed and there has been no activity on or around the Six Golden Eggs. The only activity on the third day was wind related as the wind moved one of the eggs. There has still been no sign of children activity in the general area. It is afterall spring break so perhaps many of the neighborhood children may be elsewhere. I repositioned the Six Golden Eggs closer together to make them a little more obvious. Perhaps tomorrow I will place the eggs in the wishing well basket to make them even more obvious. One week later the Six Golden Eggs remain undiscovered. 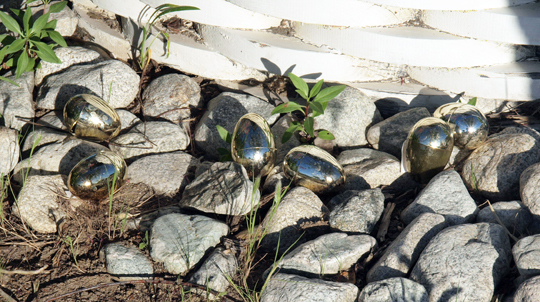 After not being discovered, the Six Golden Eggs were first placed in the wishing well bucket. On several occasions I thought that several had been taken only to learn that the wind had blown them out of the bucket. All six eggs were accounted for lying in the bottom of the wishing well. I have since placed the Six Golden Eggs at the base of the wishing well in plain sight. 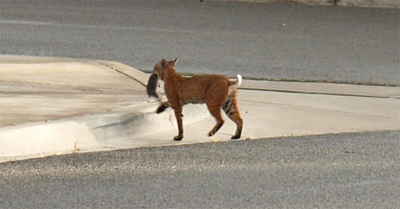 Despite children traffic in the area no one has yet found the eggs or have chosen not to take one. Mid-day I noticed that two of the eggs were missing. I checked the area out soon after noticing the missing eggs – they were nowhere in sight. I then checked out one of the remaining eggs that appeared to still be taped up. The egg still had the label stating, “TAKE ONLY ONE EGG PLEASE” still attached. On opening the egg, the one dollar bill was missing. I then checked out another egg and it was also lacking a one dollar bill. The individual(s) that claimed the two eggs apparently also claimed the contents of the remaing eggs. I suspect the recipients of the eggs were two teenaged girls that I noticed in the area late on May 1, 2011. This suspicion is based on the fact that two eggs with the attached note stating, “TAKE ONLY ONE EGG PLEASE,” were taken suggesting that two individuals took one egg each. Since the note said nothing about, “the contents of the remaining eggs not taken”, would suggest, that the recipients reading the “egg note” rationalized that they were in compliance by removing the contents of the remaining eggs and leaving the egg shells behind. Sounds like a couple of teenagers thinking a problem through that would provide them the greatest reward. This was a fun little experiment, but will need some refinements for next year. Stay tuned! SRP RAMBLINGS – Rattlesnake Love? My interest immediately peaked and I headed in the direction of the voices. I arrived as the two daughters and their mother were moving away from the area and their father was trying to locate the object of concern in a large clump of deer grass adjacent to the Cole Creek bridge crossing. Two SRP rattlesnakes - head to head. 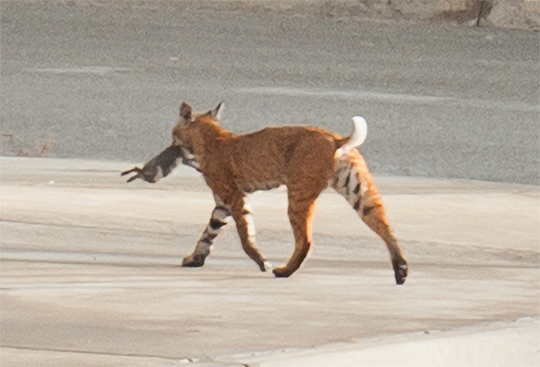 The family decided to head back towards the visitor center. I thanked them for locating the snakes and continued to observe and photograph the area hoping that they might better show themselves – unfortunately they did not. The snakes were Red Diamond Rattlesnakes. The larger snake was over 4 feet long and had a 13 button rattle. 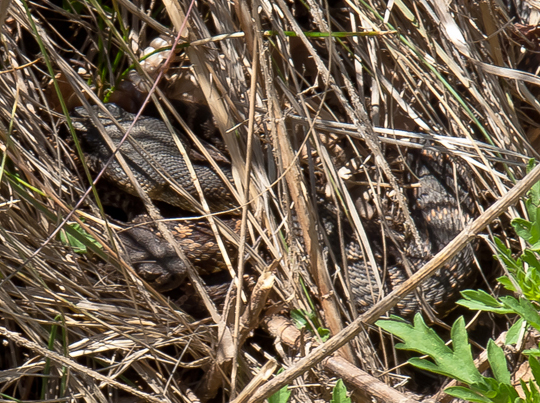 The second snake was smaller and remained motionless other than occasionally flipping a 7-8 button “rattler.” The second snake was lighter colored than the larger dark-colored snake. The larger snake also displayed a black-and-white “raccoon-banding” on its tail just before the rattle. 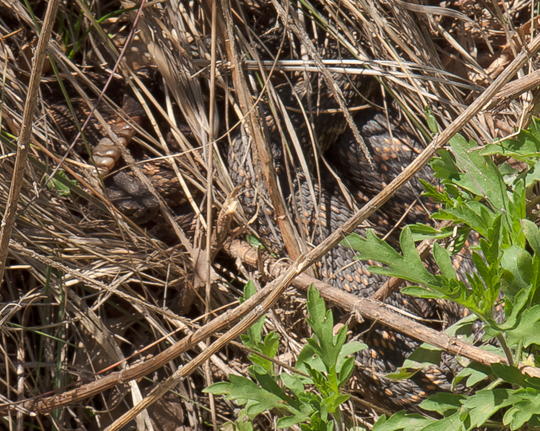 The large snake finally departed the area heading north from the observation site, while the smaller snake, as far as I can tell, remained in the original location but deeper into the deer grass. The large Red Diamond Rattlesnake had a rattle of 13 buttons. The snakes behavior was unusual with regards to their close proximity to human traffic (5-6 feet). There was no apparent anxiety prompting the snakes to warn of their presence. The larger snake appeared to be preoccupied with trying to evoke a response from the smaller snake. The smaller snake on the other hand didn’t appear to show much interest. The day before this observation a large-bodied snake track was found on the bluff above the river bed. The distance between the track and this observation was approximately 4-5 yards.